Off William Nicol, travelling north with Monte Casino on yor RHS take the next off ramp before 4 Ways Mall into Witkoppen Rd and first right into Cedar Road. Travel straight through past Chartwell on the left and Dainfern on the right on Cedar Road, until you reach a T junction, Turn left and immediately right, following the Lanseria/Sun City sign. Turn right at the next T-junction onto the R512 or Malibongwe Drive (old Hans Strjidom) towards Lanseria Airport, until you come to robots at a 3 way stop street, on your right hand side is Lanseria Centre, a large blue block building. Get onto the Pietersburg/Krugersdorp Highway direction Krugersdorp. Take the off ramp onto the R512 or Malibongwe Drive, signposted Randburg – (old Hans Strjidom) towards Lanseria Airport, until you come to a robots at a 3 way stop street. On your right hand side is Lanseria Centre. Continue straight from the 3 way stop street, travel 5 km’s passing ‘The Home of The Chicken Pie” on the left. The next landmark is an Engen Garage and Rhenosterspruit Shopping Centre on your left. About 200 m before the Engen garage you will see our sign posts – turn right onto the gravel road. 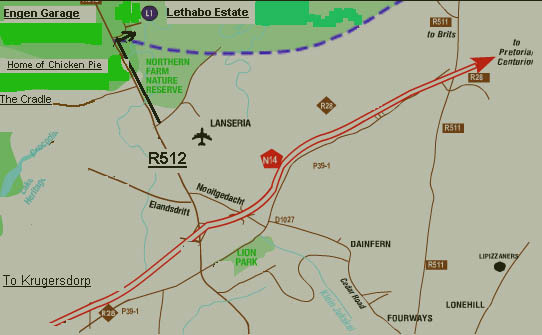 The first stretch on the gravel road is steep with lots of bends, you will go under a thatch Gateway, signposted Jukskeidrif Road, which was the old Ox wagon road from Potchefstroom to Pretoria, (bit of history…) and which is the new entrance to the Oori Game Reserve. Continue slowly on the dirt road for 2.5. until you reach a fork in the road (you will see the Blair Athol Golf Estate on your right hand side). Turn right at the wall, sign posted, ‘Lethabo’, continue down the hill, over the river and our entrance is on the left.